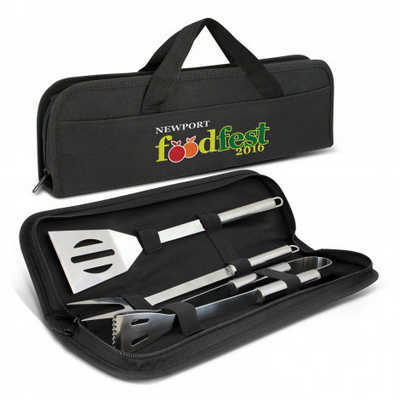 Durable barbeque set in a reinforced 600D polyester case with a large slip pocket on the front and a zippered closure. It includes a fork, a pair of tongs and a spatula, all of which are manufactured from non-stick food grade stainless steel. Colours: Case: Black. Dimension: L 400mm x W 120mm. Print Description: Case: 207mm x 40mm (one colour). Print Type: Screen Print. Packing: Loose packed. Price includes : Printing Per Position. Setup is included.